• Fast and sensitive. Use of 10 μL sample. Linear detection range 0.5 to 6 U/L for 30 min reaction at 25°C. • Convenient. The procedure involves adding a single working reagent, and reading the fluorescence at 0 and 30 minutes. Room temperature assay. No 37°C heater is needed. • DIAMINE OXIDASE (DAO) also known as histaminase or amine oxidase (copper containing), is an enzyme involved in the metabolism, oxidation, and inactivation of histamine in animals. Highest content is observed in the digestive tract and placenta. An imbalance between histamine intake and the capacity for histamine degradation can lead to histamine intolerance (HIT). Measuring DAO activity in serum can be useful in diagnosing HIT. 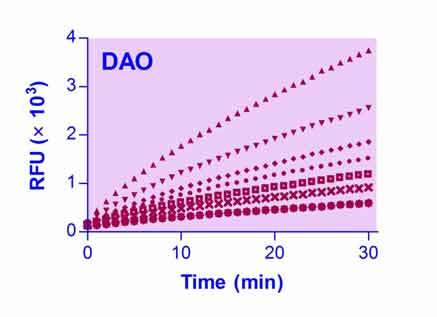 BioAssay Systems non-radioactive, fluorimetric DAO assay is based on the oxidation of putrescine to pyrroline plus NH3 and H2O2. The generated H2O2 is then used by HRP to oxidize a dye making it fluorescent. The increase in fluorescence at λex/em = 530/585 nm is directly proportional to the enzyme activity. 1. How do I store the kit? This kit is shipped at room temperature. Upon receiving, please keep the kit in the freezer (-20 to -10°C) for long term stability. 2. What samples have you tested? Serum samples were tested. Since DAO is copper dependent, EDTA should be avoided in sample preparation. Serum and plasma samples greatly influence the HRP reaction. In order to measure an appropriate ?RFU for H2O2 in a serum or plasma matrix, an internal standard is required. Yes, the assay can be used in any standard black plate or cuvette. Simply adjust the total reaction volume to your container. For 384 well use 20-90 μL, for a cuvette use 1 mL (some narrow cuvettes can hold 200-500 μL). Yes, unused reagents can be stored according to the assay protocol. Repeated freeze/thaw cycles of reagents should be avoided. Working Reagents should be made fresh for each assay and used within 1 hour. 6. I don’t have the correct wavelength filter, will the assay still work?